Would you believe that the same self-service junkyard that has the 2-for-1 Rancheros and the double or nothing Amazons also has this classic Vietnam War Era family hauler? True! Somehow, this big Chrysler made it through a pair of Energy Crises, the Malaise Era, and the Rise Of The SUV- 41 years of survival before being brought down by the Financiapocalypse. 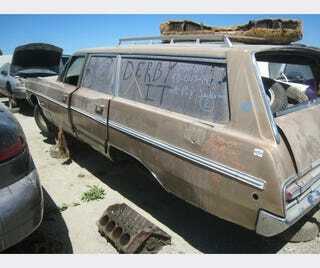 Or maybe it had been sitting in a back yard since 1974 prior to being hauled off to The Crusher's waiting room. Either way, plenty of good parts left on this wagon, so let's hope they get pulled prior to being melted down to make brand-new Cherys.